This dish is one of the “easy to impress, easy to make” repertoire of mine. Who said you can’t cook Japanese at home? 1Season the yellowfin tuna with half of the wasabi. Brush it with sesame oil. Cook the tuna in a grill pan over high heat for about a minute on each side. Once seared on the outside transfer the tuna to a bowl full with ice. Plunge it, then pat dry with paper towel. 2Slice it to 1/8 “ thick pieces. 3Slice the yellowtail to 1/8 “ thick pieces. Brush each side with yuzo juice. 4Mix all the ingredients for the miso dressing in a small bowl and set aside. 5Arrange the watercress in a plate with the enoki mushrooms. 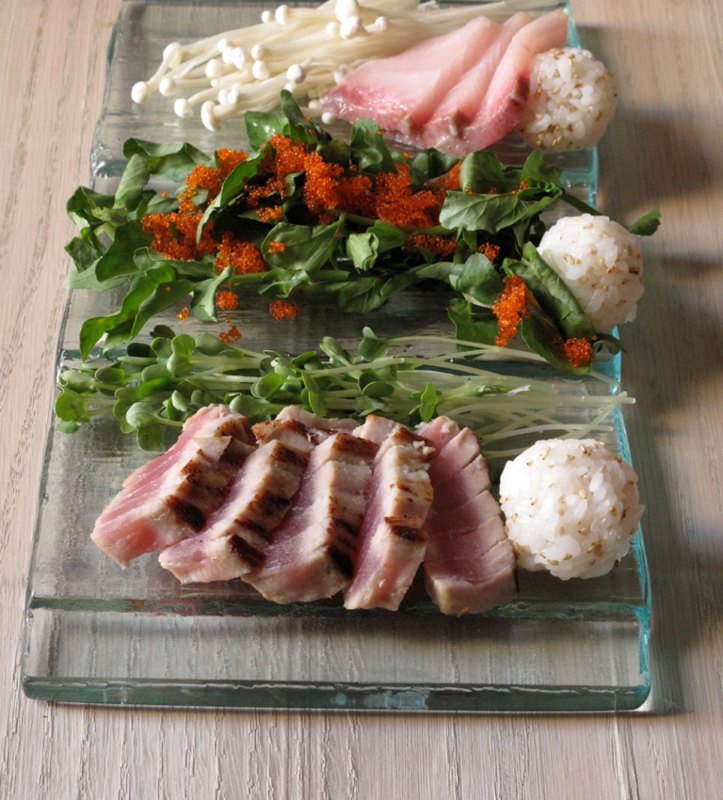 Add the yellowtail and the yellowfin tuna pieces. Top with some tobiko. Just before serving, pour the miso dressing.